Something most people don’t know they want is the ability to personalize their computer. I don’t mean cute noises and background images. I mean make it do what they want, when they want it to do it. The people who know how to make their computer the way they want to go through a lot of work to make it that way. WinBubbles is an app that has a name that gives you no clue into what it can do. I would recommend downloading it here though, it’s a little easier. 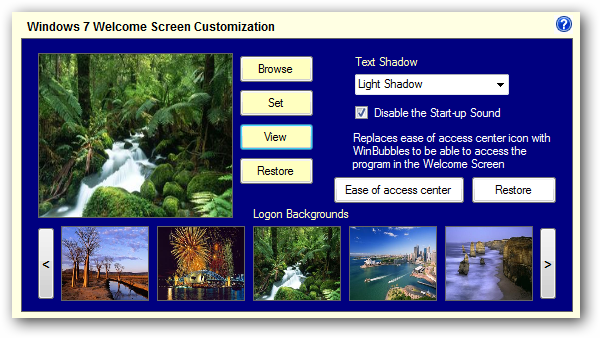 What you will notice when you download and install WinBubbles is how much you can do with it. Even though there is a lot to look at and it can be intimidating at first, you can take it tab by tab and it’s not bad at all. Like I mentioned, there is a lot going on right away. When I saw the window for the first time I grinned and said WOW! Here’s what it looks like. Look at all those options! I know I won’t be able to go over everything here but luckily when WinBubbles starts for the first time you are taken to a tutorial page on their site and it goes into a lot of detail. Let’s take a look at the different tabs for starters. The tabs describe what’s in them pretty well. As you are looking through the tabs you will see a lot of check boxes. In a lot of these tabs, you will be enabling the features. 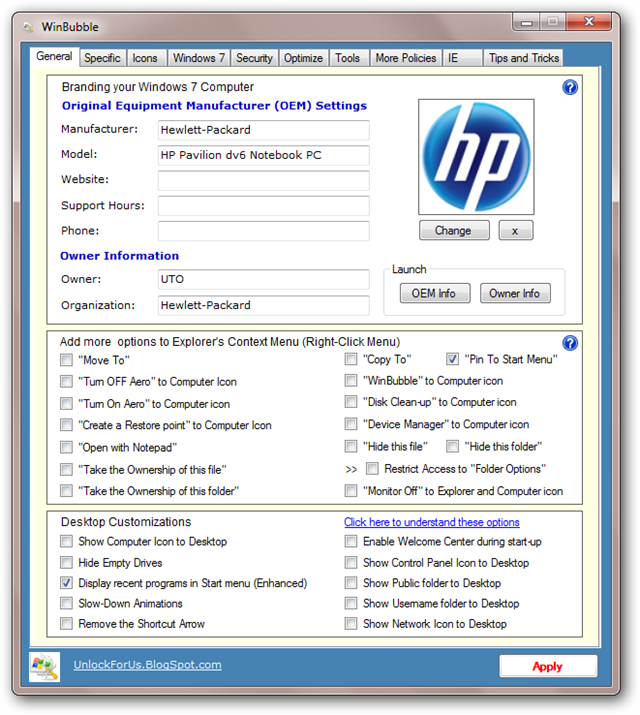 Each section in the tabs is laid out to give you all of the choices for a particular function, the example below shows the different choices for the right-click menu. All of these are choices shown are not what is normally adjustable through any Windows adjustments. As you are going through the different tabs, there are is a help option for each section. The link takes you to the developer’s site where they have a great walk-through and detail on what the section can do for you. One tab to really look closely at is Optimize. Choices like toggling the Aero on and off or increasing the bandwidth can make noticeable difference in speed. Keep in mind, for some of the features will require a refresh or a reboot to take effect. 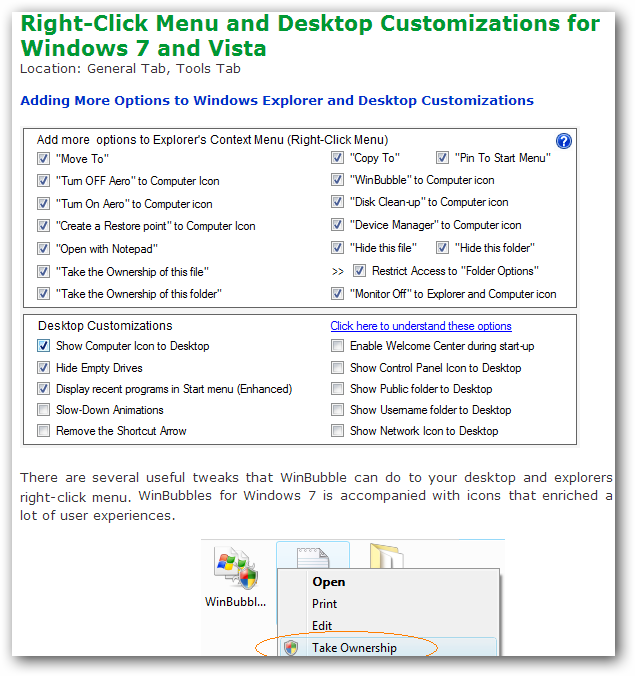 General – The right-click menu changes here can be a really powerful addition. Adding options like “Open with Notepad” and “Move to” are simple yet really useful options. Security – In the security tab you can pretty easily disable a lot of basic functions like writing to USB Drive. More Policies – The sub-tabs here offer up a lot of different ways to adjust, tweak and enable/disable features you might use everyday. This tab is kind of an everything else spot for a lot of similar features not belonging with the other groups. I mentioned earlier there was a lot to WinBubbles. With all of the different choices and options to adjust, showing you how to make a few adjustments to a computer might get you focused on just those options. I HIGHLY recommend you take some time and go through the different tabs and see what they have to offer you. If you have any question about what the options are, click the “?” or the link in that section to be taken to their site for a great explanation.